Make unique gifts to animal lovers! 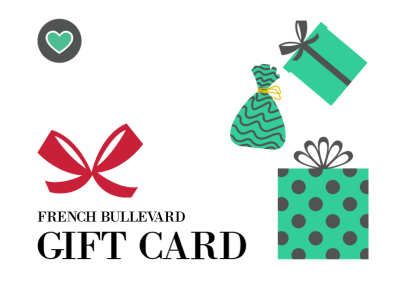 This French Bullevard gift card is ideal to offer in simplicity for special occasions or throughout the year. Pick a gift-card, and you will never go wrong. This E-Gift Card has its own custom code which will be redeemable at checkout. Please add your comments to the note section in the checkout page. Type in the e-mail address of the lucky beneficiary to whom you are offering this voucher, enter your name and write your personalized message, tell us when you want the gift card to be sent, and we will take care of the rest.